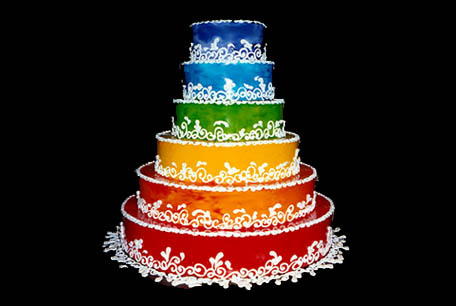 Joyous and colorful rainbow wedding cakes ideas for a fun and out there colorful rainbow wedding. A bright and colorful multi tiered wedding cake featuring all the colors of the rainbow! 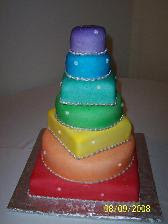 Rainbow multi tiered wedding cake in bright colors! Stunning wedding cakes with rainbow colors and pears! Four tier square wedding cake with bright and colorful wide satin ribbons at the base of each tier and citrus fruits, lemon, limes and small oranges as decoration between cake tiers. A true rainbow wedding cake made up of 6 round tiers, each tier is iced in a different color of the rainbow with colorful heart cake toppers. 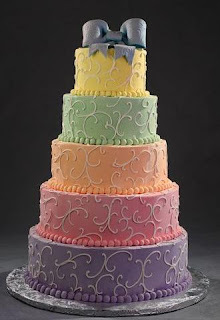 Five tiers each in a different pale color of the rainbow with rose texture. 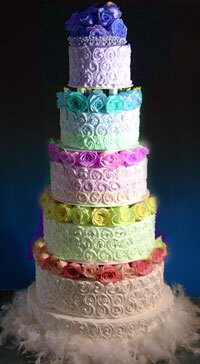 In between the tiers you will find different colored roses. 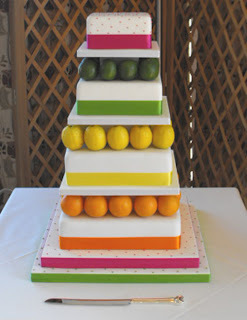 An elegant colorful wedding cake. Round wedding cake with five ties, each in a different pastel color and covered with white swirls and a dark blue swirl covered bow as a cake topper. Very similar to the wedding cake above but with bigger swirl pattern. 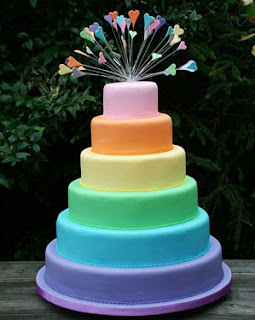 Amazing seven tier wedding deluxe rainbow wedding cake with different shaped tiers for unique effect. Following are shots of the inside of wedding cakes with a rainbow colored cake filling. 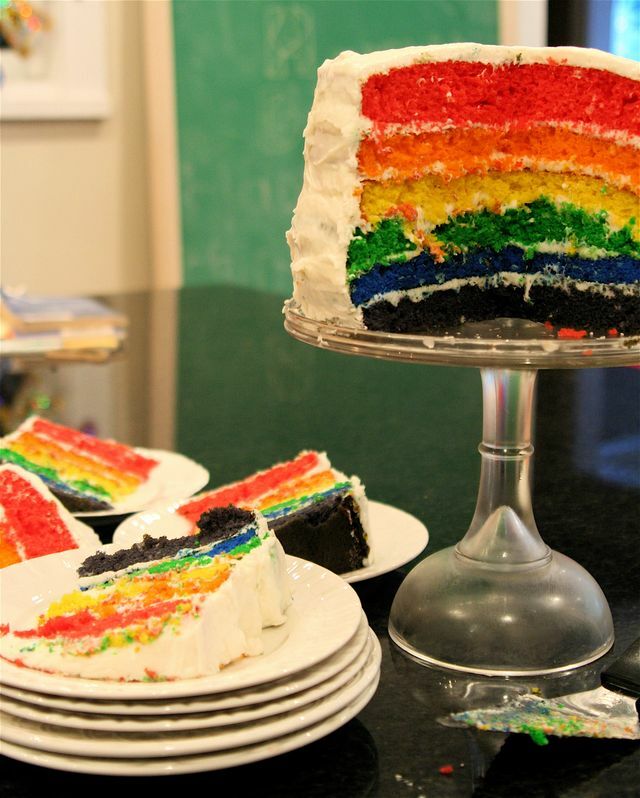 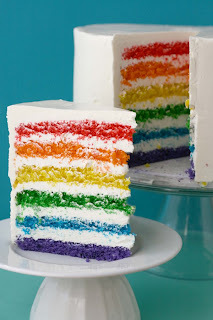 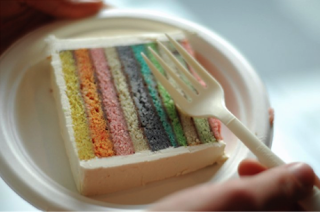 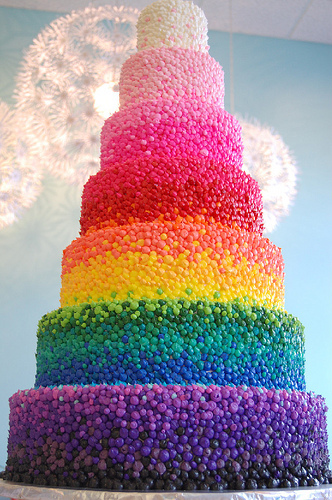 Your dream may be to have a white wedding cake that contains a surprise rainbow on the inside. 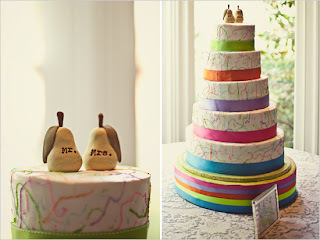 AWeeesome AWesome designs!! 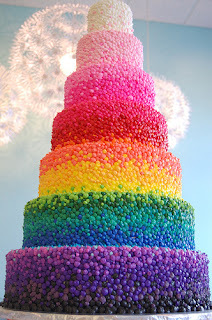 my sister has been doing cake decorating for a while now. 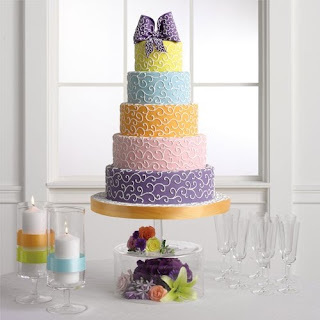 will pass your designs to her :) she'll love it!